Used For: The remedy is applied for treating flatulence, inducing urination, stimulating the digestive tract. It is known to possess astringent properties. Brier hips are especially useful for gastro-intestinal tract and provide excessive urination without affecting kidney activity. If you’re inclined to gravel or kidney stones, apply brier hips to prevent the condition or impede its development. Brier hips are also suggested for bladder and kidney inflammations. Decreasing uric acid concentration, the herb is responsible for treating rheumatic and gouty conditions. Decoction and tea are occasionally applied for reducing fevers. Additional Info: Brier hip is indigenous to open valleys and dry banks of Tennessee, Virginia and Nova Scotia. It is brought to the US from Europe, where it can be gathered on garden fences, hedges, and wood edges. The plant can reach from 2 to 13 feet in height, and features multiple stems which bear sharp prickles and spines. The leaves are complex, having 5-7 leaflets, and are ovate-formed. The plant blossoms from late spring through summer, and features red-colored flowers. 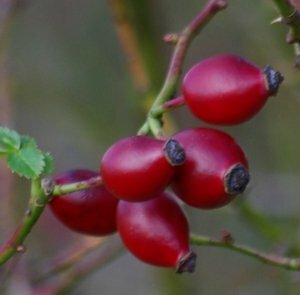 The fruits become mature in autumn and have one seed. Preparation and Intake: For an infusion take 1-2 teaspoons of fruits (without seed) for a cup of boiling water. To make a decoction, take half to a teaspoon of powdered achenes for a cup of water. Boil it down till the amount of water reduces by a half. Consume throughout the day.